Cafeterias, corporate catering, schools, health catering, hotels, take away: we equip every self service establishment thanks to our great self service range. 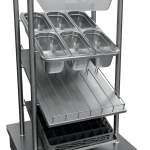 Robust and modular elements for canteens, company restaurants, school canteens, health sector catering, hotels, restaurants & take away catering.Modularity, robustness, simplicity and ergonomic of the Myself range prove the CAPIC quality.In a tasty environment thanks to the CAPIC self-service, you will be hungry for it! Thanks to its dimensions and its design, this self-service helps children to become autonomous. Its design, the quality of the materials and the manufacturing in our factory make it a great investment and a teaching tool. 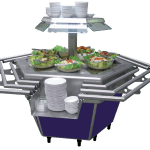 The Capic Salad’Bar is the perfect equipment for the Self-Services. This small island allows you to save space in the restaurant. It is accessible at 360°.